The Short- Foxcatcher might be deliberately slow storytelling and may underachieve as far as scripting is concerned but thanks to the performances from a transformed Steve Carell, a wonderfully brooding Channing Tatum and another great performance from Mark Ruffalo Foxcatcher has 3 of the year’s best performances. Carell is definitely a lock for a best actor Oscar nom and Tatum might end up being one of the year’s largest snubs, Foxcatcher is carried by its great performances. Steve Carell is a wonderful comedic actor, known for his award winning work on The Office and The Daily Show among other things. He is the guy who plays the idiot weather man in the Anchorman movies and while he is a talented comedic actor I doubt even his biggest fans saw this coming. Carell plays millionaire John du Pont, a man with too much time on his hands. du Pont has taken up a fascination with the world of Olympic wrestling so he starts a relationship with shy Olympic gold medalist Mark Schultz(Channing Tatum). Schultz is training for the 1988 Olympics in Seol is trying to remove himself from his brother. Also a gold medalist, Dave's (Mark Ruffalo) shadow. In Carell's performance you recognize something is not quite right with du Pont almost instantly. He is a socially awkward, drug using, gun nut and Carell plays the man in a creepy Nosferatu meets Hannibal Lector kind of way. His unusual stare, mannerisms and speech pattern are almost hypnotic as Carell carries through each sentence of E. Max Frye and Dan Futterman's script with precision. We see du Pont's strange wants and needs as he gets angry after the tank he purchased did not come with a mounted machine gun or his knack for paying people off to get exactly what he wants. Like Hannibal Lector every moment he is on screen we can't look away, no matter how strange his conversations are or no matter how awkward it is when he hijacks a wrestling practice with his cantankerous mother (Vanessa Redgrave) enters the room in an act to impress her. Sadly, Redgrave's screen time lacks and the actress isn't given enough to enter her name in the Oscar race but the few times she is on screen you can feel her icy stares and judgmental looks as they bore holes through du Pont. By far the most surprising performance comes from Channing Tatum as Mark Schultz, maybe it's because Tatum is not known for giving serious performances or it's because he is crazy good as he broods through each and every scene. Tatum's Schultz is a quite giant, a man of strength trying desperately to get out of the shadow of his brother Dave. Dave is played by Mr. Consistent Mark Ruffalo whom will probably find himself entered into the supporting actor Oscar race which will probably be considered a little tighter than normal with J.K. Simmons (Whiplash) and Edward Norton (Birdman) gathering a lot of attention for their performances. Ruffalo is excellent as Dave Schultz; he is a kinder heart then his brother and doesn't seem to understand the effect he has on both du Pont and his brother as both go between loving him and loathing him at separate sections of the film. If the acting is the best part of Bennett Miller's Foxcatcher then the film's direction and script can be considered the thing that may ultimately keep it from Oscar glory. Foxcatcher is deliberately slow, Miller wants you to get to know each of these characters and maybe it's a way of sacrificing the overall film in order to let his actors shine brightest but Foxcatcher drags on for almost its entire running time. There is a moment in each best picture nominee where the movie begins to elevate, a section where everything comes together all at once and that never happens in Foxcatcher. Miller's direction and the films cinematography are quite good but neither are totally memorable by themselves. Shots of Tatum destroying a hotel room or du Pont stewing over feelings of negligence and betrayal work thanks to the films beautiful background and the actors themselves. Foxcatcher may end up getting a best picture nod (according to Vulture's Oscar futures predictions it will indeed land a best picture nod) and it will definitely earn some awards acclaim but for that it has to thank its ensemble. A group that already ran way with a Hollywood film award for Best Ensemble to begin the awards season, Foxcatcher falls short of being my best film of the year so far with that accolade still going to Birdman. 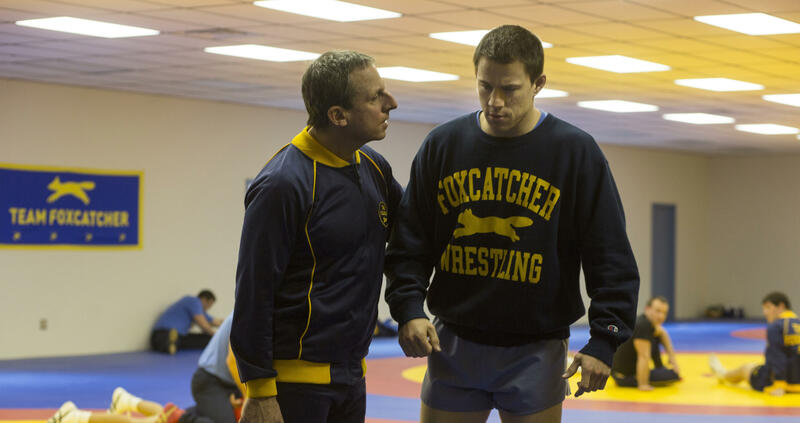 Yet even with all of that I would still highly recommend seeing Foxcatcher to just take in how good the ensemble cast really is, it's an extraordinary look at some of the finest performances of 2014, and it's those performances that leave Foxcatcher with high marks.